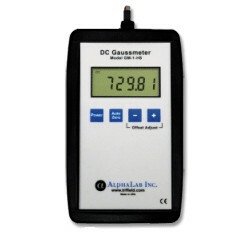 Air Shipment Milligauss Meter (Oersted Meter) - AlphaLab, Inc. Using the ZERO button for automatic offset adjust or the Offset Adjust buttons, the meter is first set to zero without the air shipment present. This compensates for the field in the room (including the earth’s field). This “zero” adjustment offset remains accurate until the sensor is moved or if something large and magnetic is moved nearby. After zeroing, the package is brought in and rotated (in a “lazy Susan” manner) 360° on the floor. 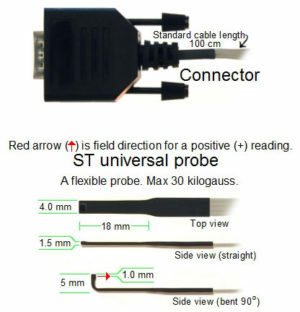 As the package is rotated, the tester is watching to see if the display ever reads over “5.25” or “-5.25” mG, or “2.00” or -2.00”, depending on which test is being done. With the fast update speed of the numerical display, the whole test requires about 20 seconds, including 360° rotation. The meter is performing “relative” field measurements when used as described above (where the meter detects up or down deviations of the field relative to the normal room field). 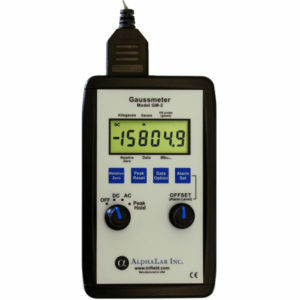 In addition, this meter can perform absolute field measurements of up to +/-1500 mG (compare to the earth field of 200 to 600 mG). This absolute measurement function is handy for checking the effectiveness of demagnetization steps and for other research and process monitoring with magnetic materials. 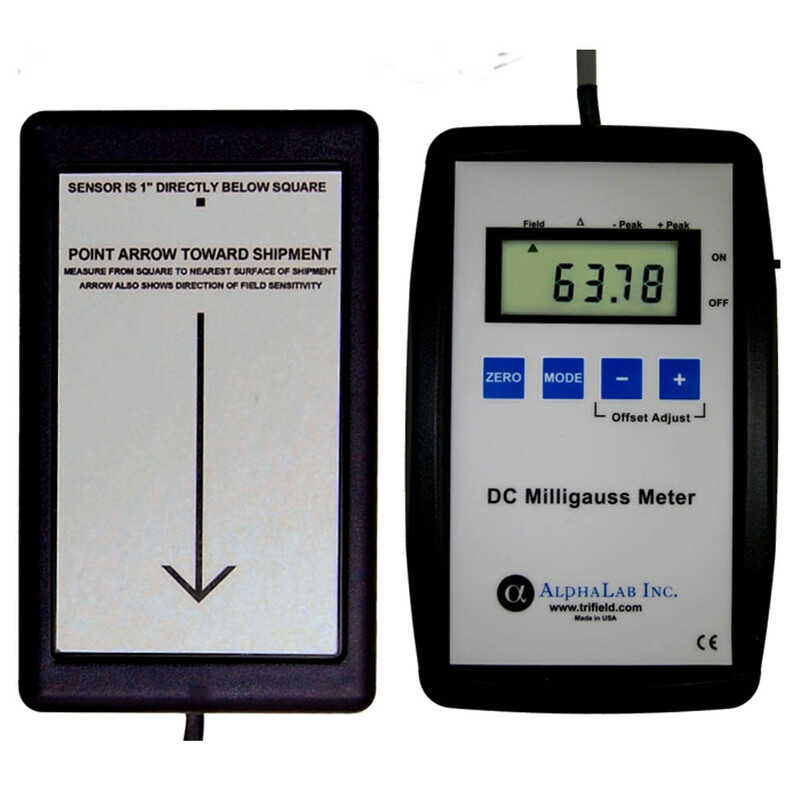 The Air Shipment Milligauss Meter is accurate +/-2% of reading in the temperature range 30°F – 120°F or -1°C to 49°C (IATA and FAA regulations only require +/-5%) and comes with certification traceable to NIST. It has a 4 ½ digit display which reads up to +/-199.99 or +/-1999.9 mG (selected by the MODE button. Accuracy guaranteed up to +/- 1500 mG). Automatic offset adjustment using the ZERO button. Test takes about 20 seconds. *IATA regulations state that any package that has a horizontal magnetic field greater than 5.25 milligauss at a distance of 15 feet from the surface of the package cannot be shipped by air or must be repacked to be below 5.25 milligauss. If the field is below 5.25 milligauss at 15 feet but above 2 milligauss at 7 feet, the package can be shipped, but must be labeled as magnetic. If below 2 milligauss at 7 feet, it can be shipped without labeling or any other restriction. For the full length version of Packing Instruction 953 (pg. 141/154) from the IATA click here.